The Tragedie of Julius Caesar dates from around 1599, and was first published by Heminge and Condell as the sixth play in the Tragedies section of their First Folio of 1623. The Folio text is thus the only authoritative text of the play and has been the basis of all later editions. Julius Caesar is also a particularly clean text with few obvious errors and comparatively few points where conjectural readings are called for. There is ample evidence of thematic ambiguity in the play, an ambiguity which the play’s editorial and theatrical history has sought to smooth over. The editorial resolution of ambiguities has closed off certain routes of interpretation, directions that the original text offers its readers and performers. This new edition presents the play in the form in which it appeared in the First Folio, restoring, for example, the Folio’s punctuation and lineation and revealing through these rhetorical emphases and nuances of characterization lost by later editorial regularization. Julius Caesar is a profoundly political play easily made to reflect the political dilemmas of the society in which it is produced. Not only is it amenable to such appropriation by virtue of its political themes but also because of its essential enigmatic nature. The editorial tradition of removing these complications has the effect of modifying and distorting the play. This edition returns the original form of the play to circulation and thereby reopens the avenues of interpretation that were originally offered by Julius Caesar. Julius Caesar, one of William Shakespeare’s plays featuring a historical figure, was an interesting look at the death of Caesar at the hands of his friend Marcus Brutus. Looking at this like it’s a novel doesn’t really work, of course. It’s a play, and was written to be dramatic. The story within this book was rather brief and simple. Not at all complex. It’s a story of tragedy, and it just seems like everything goes wrong. But that’s the way of Shakespeare’s tragedies. The edition I read has an extensive section on William Shakespeare, the source of the story (Plutarch), and commentaries by people involved in various productions of the play. Those are just extras that don’t factor into my review. The story is very simple, as I said. It’s about the downfall of Julius Caesar at the hands of Marcus Brutus and his conspirators. On Caesar’s side is Marcus Antonius, who delivers a very famous speech. It’s full of drama, that’s certain. It’s not a particularly well-written story, as it’s overly dramatic, and sometimes reads as if there are no real emotions. Take Julius Caesar’s death, for example. I found it had very little impact on me. Sure, Caesar gives the very famous line, “Et tu, Brutè?” But his death was incredibly early in the play. It’s really not so much about Caesar, but more about his killers and those who come after him, such as Mark Antony. Surprisingly, Caesar isn’t in this play very much. We don’t really get to know him well. We get to know Brutus and Antony, though. The entire story goes like this (spoiler warning! ): Brutus loves, but hates Julius Caesar. He decides to kill him because he doesn’t like the way he’s become. Caesar dies. Mark Antony makes a big speech, vows revenge. Big battle, and Brutus’ entire side dies. The end. The characters are very unlikeable, as they usually are in Shakespeare’s tragedies. Mark Antony is maybe the most likeable character, though. Brutus is a hypocrite, loving Caesar, yet wanting him to die. Caesar was portrayed as a cold leader. Antony was the most passionate, and could be considered a protagonist. But I just couldn’t sympathise with anyone. The setting was in Rome, of course. As it is a play, there’s little in the way of descriptions of the setting. You just have to imagine ancient Rome. It’s difficult to review a play in book form, especially when the language is from the late 16th century. It’s quite different than modern English, though Shakespeare’s English is considered early modern English. However, it’s not easy to read because of the differences in the language. This edition has a lot of footnotes on each page, which is extremely helpful. It’s recommended that you read it with footnotes, or else you may completely miss the meaning of many words. Overall, I would give this 3 1/2 out of 5 stars. It’s not my favourite play of Shakespeare’s, but it was enjoyable. I would recommend it to anyone who loves history (however inaccurate it may be) and classic plays. It’s also great for those who enjoy language. I enjoy Shakespeare. When I was in high school, we read one Shakespearean play every year, and I found that I actually liked it. I started reading Shakespeare again a couple years ago with Macbeth. 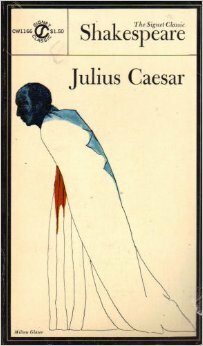 I’m now reading the first “new” Shakespeare to me, Julius Caesar. I haven’t read very much at all. So, I’d like to know a couple things. First, do you like Shakespeare? If you do, then which play is your favourite? Let me know in the comments below. My answer is Hamlet, so far. 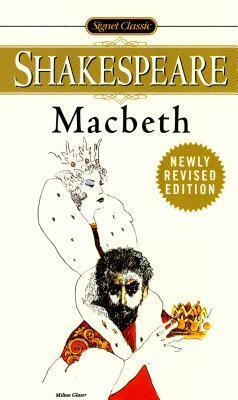 Macbeth, one of William Shakespeare’s most famous tragic plays, is a quick read despite being in Early Modern English. It’s also one of his shortest plays. It’s not easy to read this kind of English, so it makes it difficult to review. The story is a simple one of lust for power and seemingly endless murder. Macbeth, one of King Duncan’s most trusted noblemen in Scotland, is driven by Lady Macbeth and the witches to put himself into power. I could tell from the beginning that it was doomed to fail, as this is a tragic play. There is no happy ending. However, it is reasonably entertaining, being one of my favourite Shakespearean plays. I first read this in high school about 20 years ago, so it was interesting to see what I could remember. It was shorter than I remember. Nevertheless, it felt fresh and I could read it with a new, more mature perspective. Most characters are quite unlikeable. Macbeth and Lady Macbeth may be the protagonists, but who wants to see them succeed? I thought Macduff was the easiest to like, though Ross was also a good guy. The three witches provided memorable quotes, though they appeared less than I remembered. The single-mindedness of Macbeth, and especially Lady Macbeth, showed an incredible amount of obsessive ambition. I would hope to never meet anyone like them. As this is a play, it reads very differently than a novel. There is next to no narration, and is all dialogue and stage directions. However, it’s easy to follow, and the footnotes aid in understanding Early Modern English. The version I read, Signet Classic, has more than 200 pages, but the play is less than 100. There’s a lot of information about Shakespeare and the play. Overall, I give this 4 stars. It’s a great classic, and is an interesting insight into Shakespeare’s linguistic ability, as well as what was considered entertainment in the early 17th century. Definitely recommended if you can understand it.